The Melges 24 features many America's Cup innovations including the use of carbon fiber, a vertical carbon keel with lead bulb, kelp cutter, and carbon spar, rudder and bow sprit. 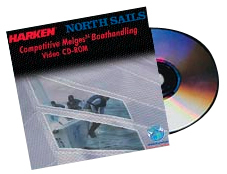 Harken's Melges 24 Boat Handling CD is a wonderful tool for learning innovative ways to sail your best. Note: the CD plays on a PC computer only. It is not compatible with a Mac Computer.